I received a copy from Ocean View Publishing via Net galley and I have to thank them for giving me an opportunity to read and review such a wonderful piece of work of Ward Larsen. A small regional jet, an ARJ-35, with registration number HK-55H carrying 21 passengers and 3 crew members disappears over Southern Colombia, Jammer Davis an aircraft accident investigator was sent in by NTSB, with information that her daughter Jen Davis was also on board. Initially no wreckage was found and through satellite search they were able to pinpoint the debris. The passengers and crew members were all dead except two girls from the manifest. Though the accident looked like a hijack something was missing for Davis, his conclusion that the plane is not hijacked is ridiculed by the team. Did Davis finds out what is the reason behind the hijack drama? Who is Passenger 19 and why it is kept secret? What it has to do with his daughter? 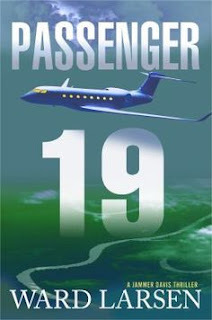 The duration of the story is 5 days of search by a desperate father to find his only daughter, Passenger 19 is breathtaking, page turner, suspense thriller with lot of twists.